Around 559 BCE a Persian prince called Cyrus (modern Persian Kurosh), claiming descent from the royal house of Persia and from its progenitor Achaemenes, became king of Anshan on the death of his father. Persia and Anshan at that time were still subject to the Median Empire, but Cyrus led a revolt against the Median king Astyages, and in 549 captured the Median capital, Ecbatana (modern Hamadan). 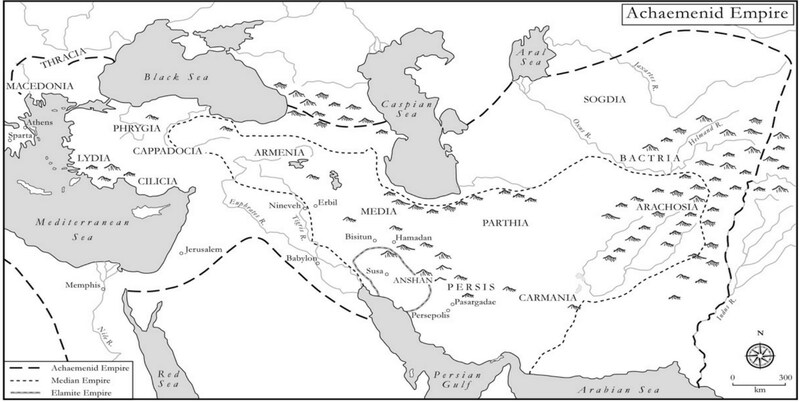 Cyrus reversed the relationship between Media and Persia, making himself king of Persia, making Media the junior partner, and Persia the centre of the Empire. But he did not stop there. He went on to conquer Lydia, in Asia Minor, taking possession of the treasury of King Croesus, legendary for his wealth throughout antiquity. He also conquered the remaining territories of Asia Minor, and also Phoenicia, Judaea and Babylonia, creating an enormous empire that stretched from the Greek cities on the eastern coast of the Aegean to the banks of the river Indus—in extent perhaps the greatest empire the world had seen up to that time. The way that the pharaohs of Egypt celebrated their rule and their victories was similar, and although Hezekiah, the king of Jerusalem, appears on the Taylor Prism as a victim, some parts of the Bible describing the Israelites and their God smiting their enemies do not read very differently. As to the region… as far as Assur and Susa, Agade, Eshnunna, the towns of Zamban, Me-Turnu, Der as well as the region of the Gutians, I returned to these sanctuaries on the other side of the Tigris, the sanctuaries of which had been ruins for a long time, the images which used to live therein and established for them permanent sanctuaries. I also gathered all their former inhabitants and returned to them their habitations. Furthermore, I resettled upon the command of Marduk, the great lord, all the gods of Sumer and Akkad whom Nabonidus had brought into Babylon to the anger of the lord of the gods, unharmed, in their former chapels, the places that make them happy. Like the proud declarations of Sennacherib, this is propaganda, but it is propaganda of a different kind, presenting Cyrus in a different light, and according to a different scale of values. Cyrus chose to present himself showing respect to the Babylonian deity, Marduk, and declared that he had returned to other towns and territories the holy images that previous Babylonian kings had confiscated. Perhaps it would have been different if Cyrus had conquered Babylon by force, rather than marching into it unopposed (in 539 BCE) after its inhabitants revolted against the last Babylonian king, Nabonidus. Cyrus was a ruthless, ambitious man; no-one ever conquered an empire without those characteristics in full measure. But we know that Cyrus permitted freedom of worship to the Jews too. He and his successors permitted them to return home from exile and to rebuild the temple in Jerusalem (being accorded in the Jewish scriptures a unique status among gentile monarchs in return). The logic of statecraft alone might have suggested that it would be more sustainable in the long run to let subjects conduct their own affairs and worship as they pleased, but that policy had to be acceptable to the Iranian elite also, including the priests, the Magi, and (leaving aside the question of Cyrus’s own personal beliefs, which remain unclear) it is reasonable to see in the policy some of the spirit of moral earnestness and justice that pervaded the religion of Zoroaster. The presence of those values in the background helps to explain why the Cyrus cylinder is couched in such different terms from the militaristic thunder and arrogance of Sennacherib. The old answer was terror and a big stick, but the Persian Empire would be run in a more devolved, permissive spirit. Once again, an encounter with complexity, acceptance of that complexity, and a response. This was something new. Unfortunately, according to Herodotus, Cyrus did not end his life as gloriously as he had lived it. Having conquered in the west, he turned to campaign east of the Caspian, and according to one version was defeated and killed in battle by Queen Tomyris of the Massagetae, another Iranian tribe who fought mainly on horseback, like the Scythians. The Massagetae are interesting because they appear to have maintained some ancient Iranian customs that may shed some light on the status of women in Persian society under the Achaemenids. There are signs in Herodotus (Book 1:216) that the Massagetae showed some features of a matrilineal, polyandrous society, in which women might have a number of husbands or sexual partners (but men only one). Patricia Crone has suggested that this feature may resurface in the apparent holding of women in common practised later by the Mazdakites in the fifth century AD and the Khorramites after the Islamic conquest, which might indicate an underlying folk tradition. Mazdaism certainly permitted a practice whereby an impotent man could give his wife temporarily to another in order to obtain a child (it also sanctioned the marriage of close relatives). But in general the custom of Persian society seems to have limited the status of women, following practices elsewhere in the Middle East. Royal and noble women may have been able to own property in their own right and even, on occasion, to exert some political influence; but this seems to have been an exception associated with high status rather than indicative of practices prevalent in society more widely. Cyrus’s body was brought back to Persia, to Pasargadae, his capital, to rest in a tomb there that can still be seen (though its contents have long since disappeared). The tomb is massively simple rather than grandiose; a sepulchre the size of a small house on a raised, stepped plinth. This tomb burial has raised some questions about the religion of Cyrus and the other Achaemenid kings (many of his successors were placed in tombs of a different type—rock tombs half-way up a cliff-face). Tomb burial was anathema to later Zoroastrians, who held it to be sacrilege to pollute the earth with dead bodies. Instead they exposed the dead on so-called Towers of Silence to be consumed by birds and animals. Could the Achaemenid kings really have been Zoroastrians if they permitted tomb burial? Some have explained the inconsistency by suggesting that different classes of Iranian society followed different beliefs; effectively different religions. As we have seen, there probably was some considerable plurality of belief within the broad flow of Mazdaism at this time. But it seems more likely that the plurality was socially vertical rather than horizon-tal—in other words, a question of geography and tribe rather than social class. Perhaps an earlier, pre-Zoroastrian tradition of burial still lingered and the elevated position of all the royal tombs was a kind of compromise. Half-way between heaven and earth: itself a strong metaphor. Around the tomb of Cyrus lay a paradise; a garden watered by irrigation channels (our word paradise comes, via Greek, from the Old Persian paradaida, meaning a walled garden). Magian priests watched over the tomb and sacrificed a horse to Cyrus’ memory each month. Cyrus had been a conqueror, but a conqueror with an imaginative vision. He was at least as remarkable a man as the other conqueror, Alexander, whose career marks the end of the Achaemenid period, as that of Cyrus marks the beginning. Maybe as a youth Cyrus had a Mazdaean tutor as remarkable as Aristotle, who taught Alexander. Cyrus was succeeded by his son Cambyses (Kambojiya), who extended the empire by conquering Egypt, but in a short time gained a reputation for harshness. He died unexpectedly in 522 BCE, according to one source by suicide, after he had been given news of a revolt in the Persian heartlands of the empire. An account of what happened next appears on an extraordinary rock relief carving at Bisitun, in western Iran, about twenty miles from Kermanshah, above the main road to Hamadan. According to the text of the carving (executed in Old Persian, Elamite and Babylonian) the revolt was led by a Magian priest, Gaumata, who claimed falsely to be Cambyses’s younger brother, Bardiya. Herodotus gives a similar version, saying that Cambyses had murdered the true Bardiya some years earlier. The revolt led by Gaumata seems to have drawn force from social and fiscal grievances, because one of his measures to gain popularity was to order a three-year remission of taxes—another to end military conscription. Pressure had built up over the decades of costly foreign wars under Cyrus and Cambyses. But Gaumata also showed strong religious enthusiasm or intolerance, because he destroyed the temples of sects he did not approve of. An Iranian revolution, led by a charismatic cleric, seizing power from an oppressive monarch, asserting religious orthodoxy, attacking false believers, and drawing support from economic grievances—in the sixth century BCE. How modern that sounds. But within a few months, Gaumata was dead, killed by Darius (Daryavaush) and a small group of Persian confederates (a killing that sounds more like an assassination than anything else). The carving at Bisitun was made at Darius’s orders, and it presents his version of events, as put together after he had made himself king and the revolt had finally been put down. The carving itself says that copies of the same text were made and distributed throughout the empire. And what a revolt it had been—Babylon revolted twice, and Darius declared that he fought nineteen battles in a single year. It was really a series of revolts, affecting all but a few of the eastern provinces of the empire. The Bisitun carving illustrates this by showing a row of defeated captives, each representing a different people or territory. Whatever the true nature of the rebellion and its origins, it was no simple palace coup, affecting only a few members of the elite. It was just the first of several religious revolutions, or attempted revolutions, in Iran’s history, and it was no pushover. Bisitun was chosen for Darius’s grand rock-carving because it was a high place, perhaps already associated with the sacred, close by where he and his companions had killed Bardiya/Gaumata. The site at Bisitun is a museum of Iranian history in itself. Aside from the Darius rock relief, there are caves that were used by Neanderthals 40,000 years ago or more, and by others generations later. Among other relics and monuments, there is a rock carving of a reclining Hercules from the Seleucid period, a Parthian carving depicting fire worship, a Sassanian bridge, some remains of a building from the Mongol period, a seventeenth-century caravanserai, and not far away, some fortifications apparently dating from the time of Nader Shah in the eighteenth century. Many historians have been suspicious about the story of the false Bardiya. The Bisitun carving is a contemporary source, but it is plainly a self-serving account to justify Darius’s accession. It is confirmed by Herodotus and other Greek writers, but they all wrote later and would naturally have accepted the official version of events, if other dissenting accounts had been stamped out. Darius was not a natural successor to the throne. He was descended from a junior branch of the Achaemenid royal family, and even in that line he was not pre-eminent—his father was still living. Could a Magian priest have successfully impersonated a royal prince some three or four years after the real man’s death? Is it not rather suspect that Darius also discredited other opponents by alleging that they were impostors? This is what I have done, by the grace of Ahura Mazda have I always acted. Whosoever shall read this inscription hereafter, let that which I have done be believed. You must not hold it to be lies. The latter part of this text, though telescoped here from the original, echoes the famous formula from Herodotus and other Greek writers, that Persian youths were brought up to ride a horse, to shoot a bow, and to tell the truth. Darius was pressing every button to stimulate the approval of his subjects. Even if one doubts the story of Darius’s accession, the evidence from Bisitun and his other inscriptions of his self-justification and the use of religion by both sides in the intensive fighting that followed the death of Cambyses nonetheless stands. It is a powerful testimony to the force of the Mazdaean religion at this time. Even the suppressors of the religious revolution had to justify their actions in religious terms. Although Darius by the end reigned supreme, the inscriptions give a strong sense that he himself was nonetheless subject to a powerful structure of ideas about justice, truth and lies, right and wrong, that was distinctively Iranian, and Mazdaean. May Ahura Mazda protect this land from hostile armies, from famine, and from the Lie. The motif of tribute and submission is also repeated from Bisitun: row upon row of figures representing subjects from all over the empire are shown queuing up to present themselves, frozen forever in stone relief. The purpose of the huge palace complex at Persepolis is not entirely clear. It may be that it was intended as a place for celebrations and ceremonial at the spring equinox, the Persian New Year (Noruz—celebrated on and after 21 March each year today as then). The rows of tribute-bearers depicted in the sculpture suggest that it may have been the place for annual demonstrations of homage and loyalty from the provinces. Whatever the grandeur of Persepolis, it was not the main, permanent capital of the empire. That was at Susa, the old capital of Elam. This again shows the syncretism of the Persian regime. Cyrus had been closely connected with the royal family of the Medes, and the Medes had a privileged position, with the Persians, as partners at the head of the Empire. But Elam too was important and central: its capital, its language, in administration and monumental inscriptions. This was an empire that always, for preference, flowed around and absorbed powerful rivals: its first instinct, unlike other imperial powers, was not to confront, batter into defeat, and force submission. The guiding principles of Cyrus persisted under Darius and at least some later Achaemenid rulers. Darius’s reign saw the Achaemenid empire in effect re-founded. It could have gone under altogether in the rebellions that followed the death of Cambyses. Darius maintained Cyrus’s tradition of tolerance, permitting a plurality of gods to be worshipped as before; and maintained also the related principle of devolved government. The provinces were ruled by satraps, governors who returned a tribute to the centre but ruled as viceroys (two other officials looked after military matters and fiscal administration in each province, to avoid too much power being concentrated in any one pair of hands). The satraps often inherited office from predecessors within the same family, and ruled their provinces according to pre-existing laws, customs and traditions. They were, in effect, provincial kings; Darius was a King of Kings (Shahanshah in modern Persian). The empire did not attempt as a matter of policy to Persianise as the Roman empire, for example, later sought to Romanise. The certainties of religion, the principle of sublime justice they underpinned, and the magnificent prestige of kingship were the bonds that held together this otherwise diffuse constellation of peoples, languages and cultures. A complex empire, accepted as such, and a controlling principle. The system established by Darius worked, proved resilient, and endured. Tablets discovered in excavations at Persepolis show the complexity and administrative sophistication of the system Darius established. Although some payments were made in silver and Darius established a standard gold coinage, much of the system operated by payments in kind; assessed, allocated and receipted for from the centre. State officials and servants were paid in fixed quantities of wine, grain or animals; but even members of the royal family received payments in the same way. Officials in Persepolis gave orders for the levying of taxes in kind in other locations, and then gave orders for payments in kind to be made from the proceeds, in the same locations. Messengers and couriers were given tablets to produce at post-stations along the royal highways, so that they could get food and lodging for themselves and their animals. These tablets recording payments in kind cover only a relatively limited period, from 509 to 494 BCE. But there are several thousand of them, and it has been estimated that they cover supplies to more than 15,000 different people in more than 100 different places. It is significant that the tablets were written mainly in Elamite, not in Persian. It is known from other sources that the main language of administration in the Empire was neither Persian nor Elamite, but Aramaic, the Semitic lingua franca of Mesopotamia, Syria and Palestine. The Bisitun inscription states directly that the form of written Persian used there was new, developed at Darius’s own orders for that specific purpose. It is possible that he and the other Achaemenid kings discouraged any record of events other than their own monumental inscriptions, but these are all strong echoes of that Iranian distaste for writing that we encountered earlier in Mazdaism, and it may go some way to explain an apparent anomaly—the lack of Persian historical writing for the Achaemenid period. It is possible that the histories once existed, and that there were poems written down and all sorts of other literature which have since been simply lost. But later Persian literary culture was strongly associated with a class of scribes, and the fact that the scribes in the Achaemenid system wrote their accounts and official records in other languages suggests that the literature was not there either. 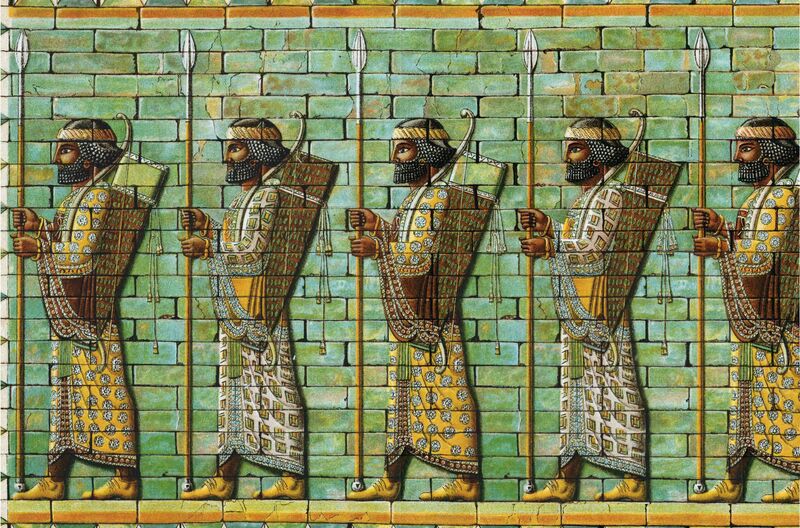 There was no Persian history of the Achaemenid Empire because the Persian ruling classes either (like the Magi) regarded writing as wicked or (the kings and nobles) associated it with inferior subject peoples; or both. To ride, to shoot the bow, to tell the truth; but not to write it. That said, no histories as such have survived from the Egyptian, Hittite or Assyrian empires either—it is more correct, in the context of the fifth century BCE, to call the innovation of history writing by the Greeks the anomaly. To ourselves, at our great remove of time, awash with written materials every moment of our working lives, dominated by the getting and spending of money, a human system that was largely non-literate and operating for the most part on the basis of payments in kind, not cash, even if it be a great empire capable of stunning monuments and great sculptural art, seems primitive. But the history of human development is not simply linear. It is not quite right to see the oral tradition of sophisticated cultures like that of Mazdaism as unreliable, flawed or backward, something we have gone beyond. The Persians were not stupidly trying, with the wrong tools, to do something we can now, with the right tools, do incomparably better. They were doing something different, and had evolved complex and subtle ways of doing it very well indeed, which our culture has forgotten. To try to grasp the reality of that we have to step aside a little from our usual categories of thought, for all the apparent familiarity of Mazdaean concepts like angels, the day of judgement, heaven and hell, and moral choice. The Achaemenid Empire was an Empire of the Mind, but a different kind of Mind. In general Darius’s reign was one of restoration and consolidation of previous territorial expansion rather than wars of conquest like those that had been pursued by Cyrus and Cambyses. But Darius campaigned into Europe in 512 BCE, conquering Thrace and Macedonia, and toward the end of his life, after a revolt by the Ionian Greeks of the Aegean coast of Asia Minor, his subordinates fought a war with the Athenian Greeks that ended with a Persian defeat at the battle of Marathon in 490 BCE. This ushered in what the Greeks called the Persian wars, the shadow of which has affected our view of the Achaemenid Empire, and perhaps Persia and Iran and the Orient generally, ever since. From a Persian perspective, the more serious event was a revolt in Egypt in 486 BCE. Before he could deal with this, Darius died. The standard Greek view of the Persians and their empire was complex, and not a little contradictory. They regarded the Persians, as they regarded most non-Greeks, as barbarians (the term barbarian itself is thought to come from a disparaging imitation of Persian speech—‘ba-ba’), and therefore ignorant and backward. They were aware that the Persians had a great, powerful, wealthy empire. But for them it was run on tyrannical principles, and was redolent of vulgar ostentation and decadence. The Persians were therefore both backward and decadent—at which point we may be irresistibly reminded (via the judgement of that supreme chauvinist, Clemenceau, that ‘America is the only nation in history that miraculously has gone directly from barbarism to degeneration without the usual interval of civilisation’) of the contemporary French view of the United States. Perhaps the view of the Greeks also was better explained in terms of a simple resentment or jealousy that the Persians rather than the Greeks were running such a large part of the known world. This in itself is a caricature of the Greek view of the Persians, and cannot have been, for example, Plato’s attitude or the attitude (openly, at any rate) of the many Greeks who worked for or were allies of the Persians at various times. The Greeks were also an imperialistic, or at least a colonising culture, of pioneering Indo-European origin. Perhaps, as at other times and in other places, the hostility between the Persians and the Greeks had as much to do with similarity as with difference. But in contrast to the Persians the Greeks were not a single unified power, being composed of a multiplicity of rival city-states, and their influence was maritime rather than land-based. Greeks had established colonies along almost all parts of the Mediterranean littoral that had not previously been colonised by the Phoenicians (including the places that later became Tarragona in Spain, Marseilles in France, Cyrenaica in Libya and large parts of Sicily and southern Italy), and had done the same on the coast of the Black Sea. Unlike the Persians again, their spread was based on physical settlement by Greeks, rather than the control of indigenous peoples from afar. Just as Persians appear in the plays of the great Greek playwrights, and on Greek vases, there are examples to show the presence of the Greeks in the minds of the Persians. As well as vases that show a Greek spearing a falling or recumbent Persian, there are engraved cylinder seals showing a Persian stabbing a Greek or filling him with arrows. But it is fair to say that at least initially, the Persians were more present to the Greeks than the Greeks to the Persians. Persian power controlled important Greek cities like Miletus and Phocaea in Asia Minor, only a few hours’ rowing away from Athens and Corinth—as well as Chalcidice and Macedonia on the European side of the Bosphorus. In Persepolis, Susa and Hamadan by contrast, Greece would have seemed half a world away; and events in other parts of the empire, like Egypt, Babylonia and Bactria for example, equally or rather more pressing. Darius was succeeded by his son, Xerxes (Khashayarsha). The set-piece of Xerxes’s reign in the historical record was the great expedition to punish Athens and her allies for their support of the Ionian revolt, but at least as important for Xerxes himself would have been his successful reassertion of authority in Egypt and Babylon, where he crushed a rebellion and destroyed the temple of Marduk that Cyrus had restored. Xerxes is believed (on the authority of Herodotus) to have taken as many as two million men with him to attack Athens in 480 BCE. His troops wiped out the rearguard of Spartans and others at Thermopylae (when Xerxes asked them to surrender, demanding that they lay down their weapons, the Spartans replied ‘come and get them’), killing the Spartan king Leonidas there in a protracted struggle that left many of the Persian troops dead. Xerxes’s men then took Athens, his hardy soldiers scaling the Acropolis from the rear and burning it, but his fleet was defeated at Salamis, leaving his armies overextended and vulnerable. He withdrew to Sardis, his base in Asia Minor, and his forces suffered further, final defeats the following year at Plataea and Mycale (479 BC). Among other effects of the Persian defeat was the loss of influence on Macedon and Thrace on the European side of the Bosphorus, permitting the subsequent rise of Macedon. Xerxes’s son Artaxerxes (Artakhshathra) succeeded him in 465 BCE, and reigned until 424 BCE. The building work at Persepolis continued through the reigns of both, and it was under these two kings that many of the Jews of Babylonia returned to Jerusalem, under the leadership of Ezra and Nehemiah. The latter was Artaxerxes’ court cupbearer in Susa, and both returned eventually to the Persian court after their efforts to rebuild Jerusalem. The books of Ezra and Nehemiah give a different picture of the Persian monarchy to contrast with the less flattering image in the Greek accounts. The wars that continued between the Persians and the Greeks ended at least for a time with the peace of Callias in 449 BCE, but thereafter the Persians supported Sparta against Athens in the terribly destructive Peloponnesian wars, which exhausted the older Greek city-states and prepared the way for the hegemony of Macedon. At the death of Artaxerxes palace intrigues caused the deaths by murder of several kings or pretenders in succession. In the reign of Artaxerxes II (404-359 BCE) there were further wars with the Greeks, and a sustained Egyptian revolt that kept that satrapy independent until Persian rule was restored under Artaxerxes III in 343 BCE. Palace intrigue and murder had already claimed the lives of several of the Achaemenid kings, but a particularly lethal round of events orchestrated by the vizier or chief minister Bagoas caused the deaths of both Artaxerxes III and his son Arses, bringing Darius III to the throne in 336 BCE. The Iranians must have changed their way of life considerably over the two centuries between the reigns of Cyrus and Darius III. One indicator of social change (as is often the case) was the constitution of their armies. At the time of Xerxes’ invasion of Greece and before, large numbers of Medes and Persians fought on foot, but by the time of Darius III the armies were dominated by large numbers of horsemen and the previous Assyrian-style big units of spear-and-bow armed infantry (and shield-bearers—sparabara) seem to have disappeared (though there were Greek mercenary infantry, and Persian infantry called Cardaces who may have been young men in training for the cavalry). The impression is that the wealth of empire had enabled the Iranian military classes to distribute themselves across the empire and supply themselves with horses, changing the nature of Persian warfare (though there seems also to have been a deliberate policy of military garrisoning and military colonies, notably in Asia Minor). According to Herodotus, Cyrus had warned that if the Persians descended to live in the rich lands of the plain (he probably had Babylonia particularly in mind) they would become soft and incapable of defending their empire. It is too neat to suggest that this is precisely what happened—it may be somewhat the contrary, that by the time of Darius III taxes had risen too high and the Iranians, having had their expectations raised, had become impoverished and demoralised. But whatever their exact nature, fundamental changes had taken place, and Iran had already moved closer to the social and military patterns of the later Parthian and Sassanid empires.